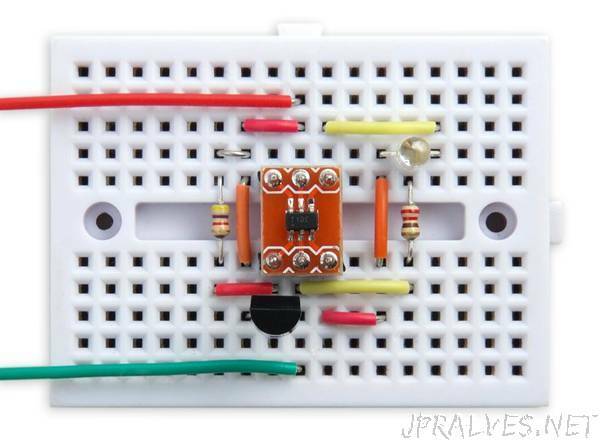 “This is a small battery-powered thermometer that displays the temperature as a series of red and green flashes on an LED. The thermometer consists of an ATtiny10, a DS18B20 1-wire temperature sensor, and a bi-colour LED. To avoid the need for a digital display, and minimise current consumption, the thermometer pulses the temperature as a series of red or green flashes on the bi-colour LED. I designed it so I could seal it in a small waterproof enclosure and put it outside the window, allowing me to see the outdoor temperature from inside. It incorporates several power-saving features to enable it to run for over a year on a CR2032 button cell. Some time ago I designed a flashing thermometer based on an ATtiny85, using the ATtiny85’s internal tempreature sensor: Flashing Thermometer. Despite its elegant simplicity the circuit wasn’t very accurate, because of the limitations of the internal temperature sensor. I recently wanted to build another thermometer, and decided this time to base it on a DS18B20 1-wire temperature sensor that has an accuracy of 0.5°C and doesn’t require calibration. I decided to use an ATtiny10 for the processing, so I could eventually make a version with SMD components on a PCB the same size as a button cell. For this prototype I used through-hole components and an ATtiny10 on a breakout board.